A mega Message.io product update! 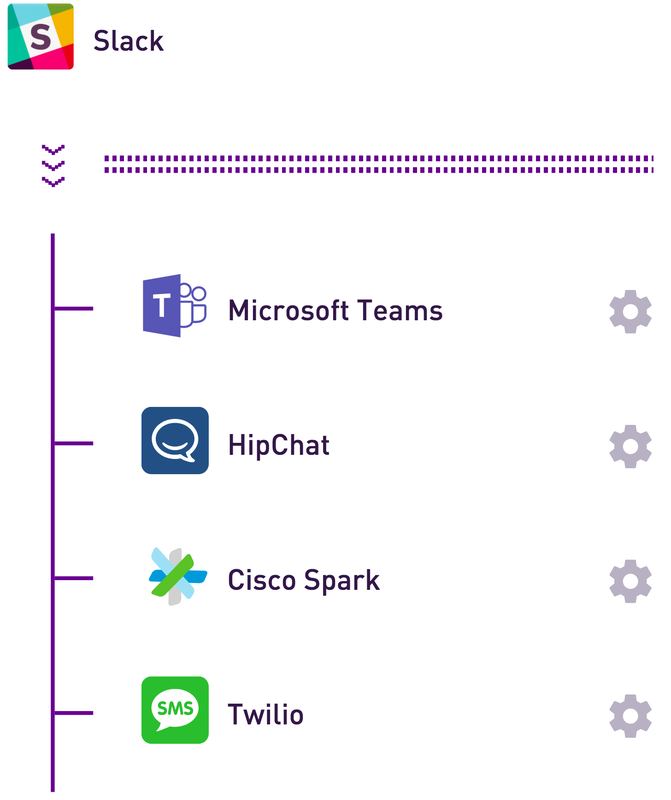 More enterprise cross-platform goodness for all! It’s been a 🔥 summer in Austin, TX and we’ve been heads down at Message.io HQ with air conditioning ⛄ building enterprise bot magic ✨ for you. We’ve private-beta tested with many developers for the last several months, and have thus streamlined our user flow to make cross-platform bot deployment pretty dang easy. If you’ve been patiently waiting to create an account, your wait is over! Just go to message.io and sign up for yourself! There’s many more platforms in the works, so follow us here on Medium to stay up to date! We interrupt this product update to interject a brief recap for any newbie readers! 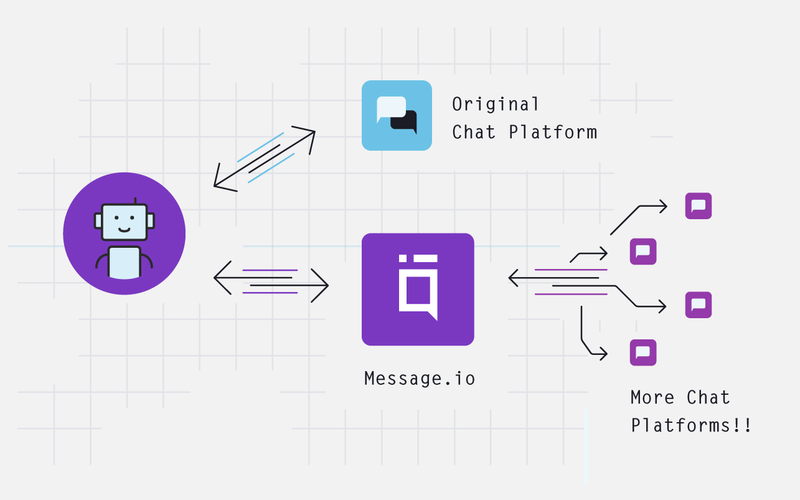 As a quick reminder, Message.io enables bot developers to deploy existing chat apps & bots to enterprise chat platforms using real-time API translation. Simply connect your bot, sign up for accounts on all the enterprise chat platforms, and watch you bot work for business customers everywhere. Connect to Message.io for real time bot translation! 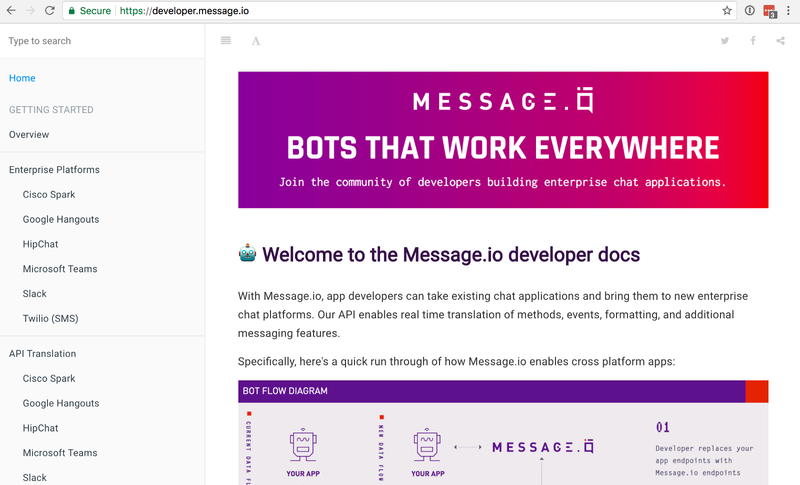 Once you’ve connected a bot directly to the Message.io API, you’ll go through a registration process that prepares your app to launch on any of the platforms mentioned above. After creating developer accounts for the supported platforms, our product takes you step-by-step to deploy your application. The setup process is quick and it’s a great opportunity to get your product on several platforms in order to discover new enterprise customers today. And now we’ll return back to our product updates! Once you’ve gone through the Message.io bot signup flow, you’ll have a new and improved dashboard for all details regarding your bot. 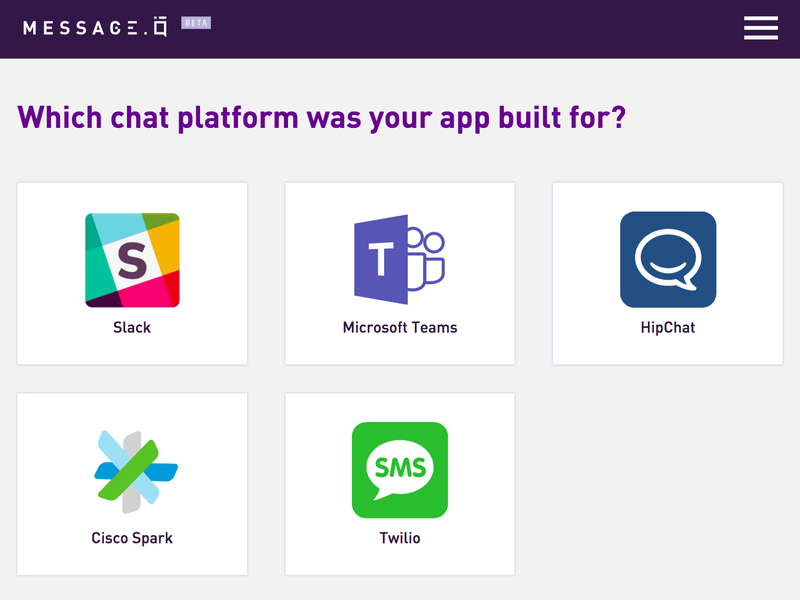 See your opportunities for more platform reach — As we continue to add more enterprise chat platforms, they will appear here. 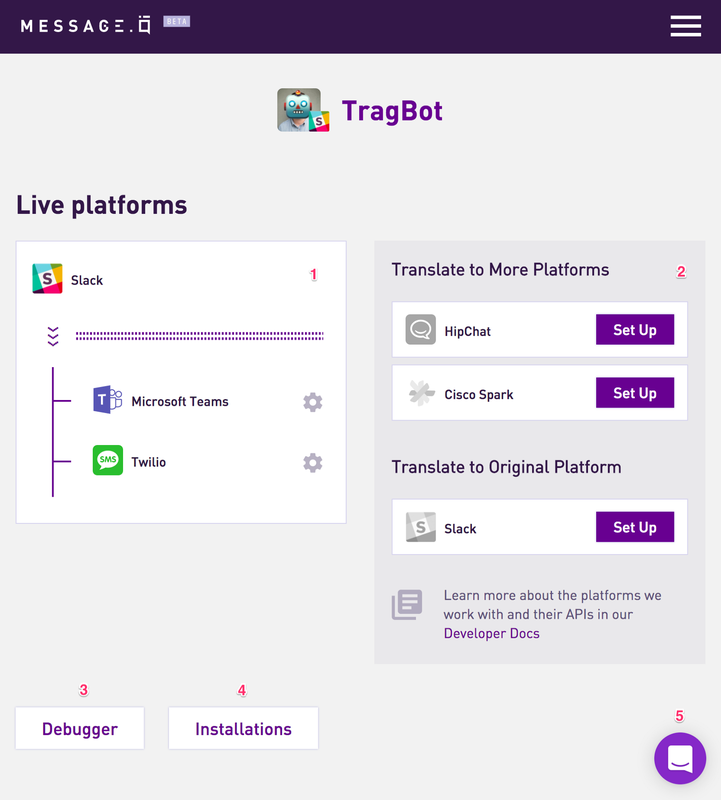 Debugger — Once you’ve connected your bot, track the API calls through our bot dashboard in real-time. Installations — An easily accessible list of all users connecting to your product, ensuring connectivity. Live Support — We’re going all-in on rapid support, so we’ve baked Intercom into our site, reach out if your ever stuck or confused. Often the issues faced by developers involves the setup and registration process within the various enterprise chat platforms websites. Other times, we’ve goofed up and are *very* grateful for your feedback on what’s not working. We’re committed to helping our customers get unblocked and launched. All supporting documentation for all above mentioned platforms is now live! Head over to developer.message.io and learn more about how Message.io works, API translation, and more. Multiple commands per bot supported for HipChat, Slack, and more. OAuth brokered for Non Oauth platforms (JWT, etc). Enables developers to not worrying about the specific platforms authentication process. With several major enterprise chat platforms launching this year, you can sure bet we’re paying attention. We’re looking forward to helping bots everywhere reach the enterprise. Connect with us on Twitter and follow us here on Medium to stay up to date. Oh, and sign up at Message.io while you’re at it!